Medical care is not enough to address the impact pediatric disabilities and illnesses have on caregivers and family members. Medical care is not enough to address the impact a disability or illness has on caregivers and family members. 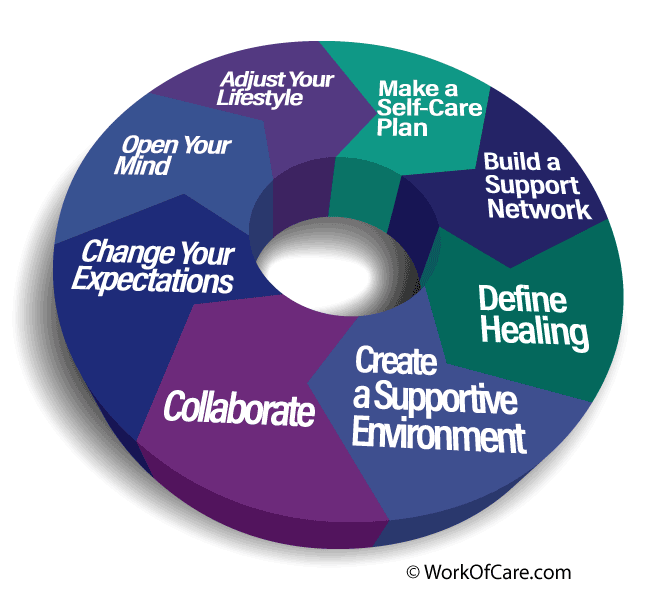 These 8 Steps address lifestyle and environmental aspects of care necessary to create a supportive environment for you and your family. You must take care of yourself to effectively create an environment that supports your family. (This is not about ‘putting the oxygen mask on first” – you are flying the plane!) Self-care is not a luxury, it’s a necessity. It’s not easy to prioritize your own needs when there are so many others’, but this is an essential part of sustainable Work of Care. Creating a self-care plan before you need one helps you make (and model) healthy choices. Proactively caring for your own needs will ensure you have the energy and spirit to care for others, and helps to prevent ‘burnout’ and ‘compassion fatigue’. The experience of caring for someone with a chronic illness or disability can be challenging. You will need people who can love and accept your family, and support you through this challenging time. (Hint: These may not always be the people you expect!) Families affected by illness or disability can experience social isolation, unhealthy stress, marital problems and financial difficulties. These circumstances can adversely affect close relationships. Know whom you can count on for support. Define “health” on your own terms. It is common in Western medicine to think of being “healthy” or “well” as the absence of illness – but for some people wellness may be the ability to go out to dinner, or enjoy family gatherings. For children, wellness may be an improvement in social skills, attending school more often, or being able to participate in a team sport. Creating goals that represent milestones will help you appreciate important progress being made. Even if your loved one may not be “cured”, they can be “well” in a way that is specific to their circumstances, priorities, and needs. Your definition of health may change as an illness, context, or environment change. Make sure your doctor knows what is most important to you, your family, and your loved ones. Some people with chronic conditions can be extra-sensitive to pesticides, toxic chemicals, mold, dust, or other allergens. Make sure produce is washed thoroughly and purchase organic vegetables when they are affordable. Use non-toxic alternatives to clean your home, and avoid products containing harmful chemicals (this may include everything from cleaning or laundry supplies to house paint). Be aware that some personal care products may contain chemicals considered toxic or carcinogenic. Attending to these details when under stress can be challenging, but creating a clean and healthy environment will support emotional and physical well-being. When someone has an illness or disability their body may confuse them at times, or feel beyond their sense of mastery or control. They may benefit from a home environment that is orderly, safe, and predictable. In our culture it is common to live more reactive, busy lives that may not encourage the rhythms that promote healing and well-being. Rituals, routines, simplicity and order will all help you and your family feel more at ease amidst the challenges an illness or disability presents to your family. A person with an illness or disability is not the only one affected. Other family members, including a child’s siblings, experience multiple stressors related to having a chronic illness or disability in their household. Time and family resources may be skewed toward the person with an illness. Social opportunities can be limited, and finances strained. Consider the specific needs of your family, and how the presence of a chronic illness or disability affects their lives – both positively and negatively. Physicians, nurse practitioners, teachers and other professionals are an important and useful resource to help you determine the best path to wellness, but caregivers, parents, and children need to be empowered to advocate for their own perspective, needs and priorities. Also, your needs and priorities may change – and that is okay. Trust your gut, and work to collaborate with medical, mental health, and education professionals who may require help understanding the nuances an illness or disability, and the specific needs of you and your family. You may not be able to maintain your current schedule of commitments and activities. A good rule at I time of crisis: At least 50% of your energy that was spent elsewhere needs to be redirected towards your well-being. This includes attending to your mental and physical health as you work hard to support others. Personal and professional goals may need to be put on hold temporarily. Family plans may need to be redesigned to accommodate flaring symptoms, or physical or psychological limitations. Try to make each day count in its own way – knowing that an accumulation of good days will keep you on track for when you are ready to recommit to goals and plans that may have been put on hold. 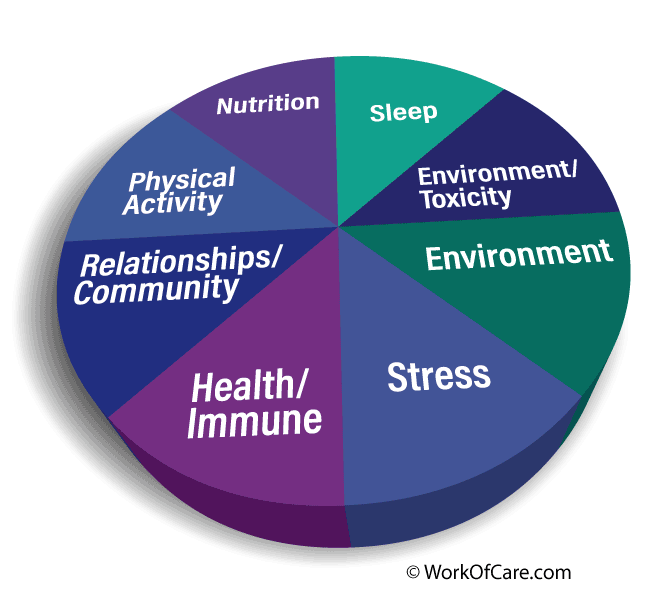 For many people with disabilities or chronic illnesses, multiple areas of health and well-being need attention. Interventions such as massage, naturopathy, environmental medicine, yoga practice, meditation, tutoring, acupuncture, exercise, food choices, herbal medicines, and social support can help promote healing and well-being. While a healthy skepticism is important, be open minded about non-medical interventions and lifestyle choices that could contribute to a positive outcome. A reduction in work hours, extracurricular activities, and travel or social plans may be necessary. Revise your lifestyle to allow for flexibility. Days off work or school, travel to doctor’s appointments, and time to rest, will all be more challenging if you are trying to ‘fit them in’ to your normal, established routine. Remember, symptoms and circumstances may change on a day-to-day basis. You may not always be able to plan ahead, and will sometimes need to make last minute changes to your schedule. An essential part of creating an environment supportive of health and wellness, food choices have helped many people with illnesses (such as chronic infections) and disabilities (including ADHD) control inflammation and symptoms. For people with conditions like diabetes or heart disease, diet changes are integral parts of medical treatment. Multiple online resources are available for recipes and ideas about making dietary changes. It requires commitment, and planning ahead for special occasions and holidays, but it can be an important part of health and healing. It is challenging to manage medications, cook nutritional meals, make lifestyle changes, and educate yourself and others about your family’s experience and needs. You may need support in building the skills necessary to manage the many areas of life affected by illness and disability. Some caregivers feel overwhelmed, or believe they are failing, when all they really need is some help learning skills like time management. Caring for someone with an illness or disability in our culture is extremely challenging. You cannot compare yourself to people around you who do not share these circumstances. You can make changes to be more effective.